Any quantity only $24.99 per oz over spot! The newest coins added to the Proof Silver Libertad collection are the 2 oz and 5 oz options. These joined the program a decade after the 1986 introduction of the 1 oz coin in the series and have featured extremely low mintage figures throughout the course of more than two decades of striking. 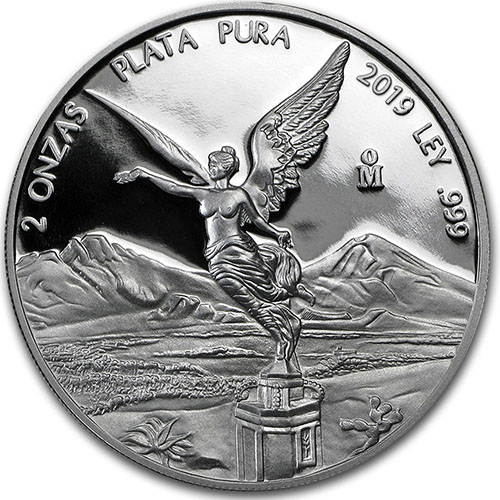 The 2019 2 oz Proof Silver Mexican Libertad Coin is currently available to you for purchase online at Silver.com. Coins ship to you with a protective capsule! 23rd issue of 2 oz Proof Silver Libertad coins! Availability of proof coins in this series is limited! On the obverse is an image of Winged Victory. The reverse field features the coats of arms of Mexico. The Mexican Mint added two larger coins to this series in 1996 with the addition of the 2 oz and 5 oz coins. At that time, the Proof Silver Libertad offered buyers a 1 oz coin and four fractional weights. The larger coins took time to catch on with collectors. Mintage figures through the first decade rarely surpassed 1,000 coins for a given date mark. Like all other versions of the Proof Silver Mexican Libertad, save the 1 oz coin, none of the 2 oz Proof Silver Libertads were produced by the Mexican Mint in 2012. Recent years have seen the 2 oz coin surge in popularity alongside all of its counterparts, setting mintage figures of 3,950, 3,050, and 5,000 coins in the respective issues from 2016 to 2018. The obverse side of 2019 2 oz Proof Silver Mexican Libertad Coins feature the image of Winged Victory. She’s been a symbol of resistance and pride for Mexico dating back to its war for independence from Spain in the 19th century. She was first featured on Mexican coins in 1921 with the release of the commemorative gold Centenario coin to mark 100 years of independence. Her figure was also erected that year atop the Mexican Independence Victory Column in Mexico City. On the reverse side of 2 oz Proof Silver Mexican Libertad Coins is a total of 11 different versions of the Mexican coat of arms. The design field focuses on the modern version of this seal in the very center, but it is flanked all around in a circle by 10 different historic depictions of the national coat of arms. These 2019 2 oz Proof Silver Mexican Libertad Coins are available to you from the Mexican Mint with a protective capsule. The coins feature contrasting fields of frosted, matte design elements and mirrored, clear backgrounds. We encourage Silver.com customers to call us with questions at 888-989-7223 when buying silver. You can also reach out to us live online using our chat service or email us directly.